Pastoralism is an ancient form of self-provisioning that is still in wide use today throughout the world. While many pastoral regions are the focus of current desertification studies, the long history of sustainability evidenced by these cultures is of great interest. Numerous studies suggesting a general trend of desertification intimate degradation is a recent phenomenon principally attributable to changes in land tenure, management, and treatment. This paper explores the suggested causes of land degradation and identifies the land management and grazing treatments shared by many pastoral cultures. The singular commonality found in nearly all studies of degradation is the prevalence of partial or total rest. While historical observations rightly suggest that desertification is the result of both climatic and anthropic factors, recent focus has been placed upon the effect of sedentarisation. This paper attempts to coalesce these two streams of thinking with particular focus upon inclusive planning processes which may improve arid and semiarid rangeland ecosystems using livestock as a solution to the problem of land degradation. The idea that people can affect tremendous changes on the landscapes initiated a review of the commonalities and differences among the many societies and cultures inhabiting the arid and semiarid regions of the world. Of particular interest were the commonalities in land use, specifically livestock grazing. The results revealed some surprising patterns and at the same time raised additional questions. The fundamental postulate explored in this paper is whether the changing face of pastoral societies, resulting from market integration and sedentarisation, has consistently lead to land degradation as is commonly intimated in the literature today. To discuss and appreciate the study of land degradation in arid and semiarid ecosystems, one must begin with an understanding of pastoralism as this has historically been the principal land use known across these regions. Pastoralism may be perceived as demanding only minimal skills. The shepherd or herdsman simply keeps his stock alive so that he may subsist on the animals' milk, blood, wool, meat, and value in trade. Just beneath this thin veneer, however, rests a myriad of complexities involving forage, animal health, reproduction, predation, weather, and the social and cultural fabric within which the pastoralist functions. Over time, pastoral cultures have developed and the complexities mastereda (Mapinduzi et al. 2003; Stock 2004). As a result, contemporary pastoralism should be considered a dynamic lifestyle that has evolved well beyond a subsistence economy. It is not without debate that pastoralism developed after agriculture (Khazanov 1994, Flannery 1965) and most likely developed as people migrated into areas of low productivity and/or regions of unreliable rainfall. As a result, these people came to rely upon domesticated animals for subsistence instead of agricultural crops (Salzman 2004; Cummins 2009). Over time, three unique forms of pastoral production took hold: (1) sedentary production, (2) transhumance, and (3) nomadism (Yalcin 1986). Sedentary pastoralism involves keeping livestock near farms and villages year-round while transhumance includes the seasonal movement of animals and people from valley bottoms to mountain pastures (Yalcin 1986; Ott 1993; Cummins 2009). Nomadic pastoralism may have developed in response to recurring and wide-spread drought (Salzman 2004) and is typified by livestock being moved in constant search for forage. Nomadism differs from transhumance in that no permanent base (home or village) is developed and likewise, no pre-defined series of movements are used. Much of what are considered rangelands today (Bedell 1998), and indeed the specific focus of this paper, occur within the arid and semiarid regions of the world. These areas are typically dominated by grasses, forbs, and shrubs and are managed without cultivation, irrigation, herbicides, pesticides, or fertilizers. Indeed, the primary management tools for pastoral production in these rangeland regions are livestock and fire (Savory 1999; Bassett and Crumney 2003). Through the use of these tools, the pastoralist has learned how to manipulate his/her flock (or herd) to graze or avoid certain patches of vegetation and thereby effect subsequent changes in land cover over time. While the term rangeland is a more inclusive term than "grasslands" (many savanna ecosystems are also considered rangelands), within the scope of this paper, rangelands are defined by land use (i.e., livestock grazing) and land management (i.e., non-irrigated, etc.) rather than by any geographic or environmental classification. Map of general distribution of traditional pastoralists worldwide. 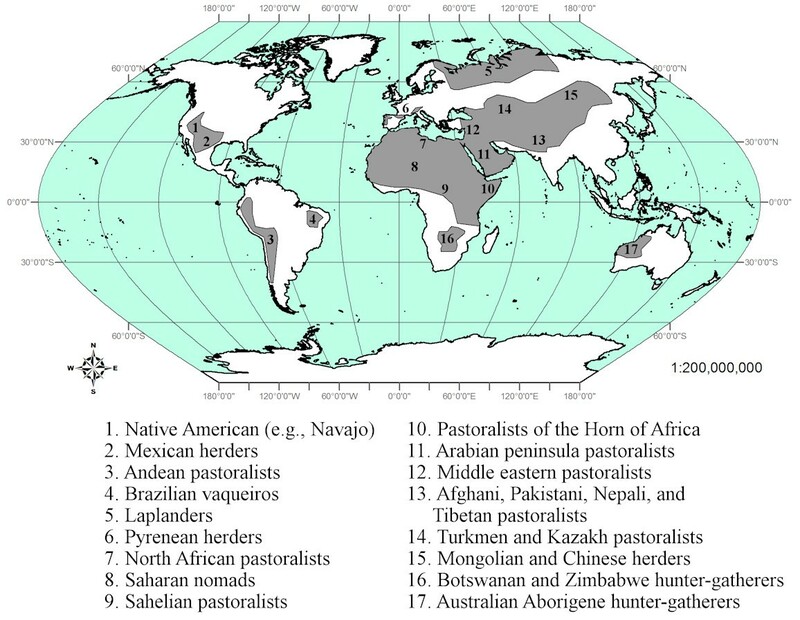 (Note: the terms pastoralist, herders, and hunter-gatherers and general region map from Niamir-Fuller 1999). Similar to the term rangelands, a working definition of desertification is necessary to properly construct this paper. Desertification is a term first used by Auberville (1949) which refers to the severe degradation of the arid, semiarid, and sub-humid areas of the world due principally to climatic and anthropic factors (UNCCD 1995; Arnalds 2000). Desertification was also used by Savory (1999) to refer to the manifested symptom of biodiversity loss in arid and semiarid environments while more recently, Reynolds (2001) defined desertification as a reduction in the productive potential of the land. A common thread throughout each of these definitions is the concept of a degraded landscape which is no longer as productive as it once may have been. It is this concept that embraces the term desertification as it is used in this paper. While most scholars will agree that substantial areas of the earth's surface have desertified (Prince et al. 2009), an active debate has emerged challenging the estimates and inferences made as a result of earlier studies (Tucker et al. 1991; Hellden 1998; Prince et al. 1998; Veron et al. 2006). Whether all estimates of desertification ever published are wholly accurate or not is a moot point when one considers the perception of decision-makers that rangelands are degrading and that some form of intervention or change in practice or policy must be enacted to prevent further desertification. A common remedy to improve degraded rangelands has been the removal of livestock (i.e., de-stocking). Under more systematic grazing regimes, rest is deliberately used as a temporary de-stocking that often serves dual roles as both a pre-determined scheduling process and conservation practice. Under less systematic regimes, the term recovery is often applied, inferring an active management decision that allows plants to recuperate before additional grazing is allowed. In contrast to rested pastures, the length of the recovery period is not pre-determined (Voisin 1988) but rather, decided upon by the pastoralist based on his/her knowledge and experience. The most extreme form of de-stocking is abandonment. In western cultures, abandonment is equated with failure, while in other pastoral cultures; abandonment may be part of the normal management process (Stone 1993; Hill 2006). In essence, all pastoral cultures have applied intervals of no-grazing (rest, recovery, and abandonment) along with periods of active grazing as part of their historic and traditional grazing practices. The only real difference is the duration of the no-grazing period which may be a function of seasonality (Voisin 1988) and the resilience or brittleness of the environment (Savory 1999). An example of excessive litter accumulation degrading through oxidative rather than biological means. Partial rest is a term coined by Savory (1999) to describe situations in which animals are grazing in a "spread out or non-bunching behavior" resulting in insufficient disturbance of the soil surface and limited trampling of moribund grasses. This can occur under any grazing practice. When herds remain relatively sedentary over long periods of time (e.g., a month or more) during the growing season, overgrazing of plants occurs due to the duration of time plants are exposed to grazing animals. Additionally, the soil surface remains undisturbed when animals graze at low stocking densities and/or in small herds. Overgrazing of plants, combined with the adverse effects of bare soil and moribund grasses, exacerbates an already declining rain-use efficiency through both increased runoff and soil surface evaporation of water (Snyman 1998; Savory 1999; Huxman et al. 2004). While some plants within a pasture will be grazed repeatedly others remain un-grazed and over time, moribund grass accumulations form just as they do in over-rested areas. As a result, overgrazing damages or kills repeatedly grazed plants while un-grazed moribund grasses are weakened, and the rangeland enters a feedback cycle of slow but progressive degradation (Savory 1999). 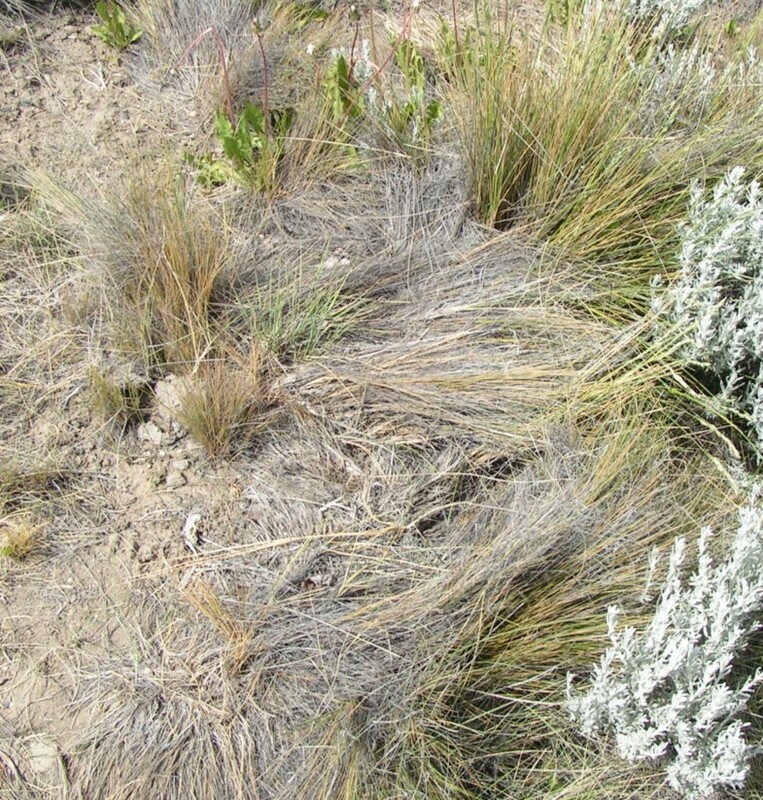 Today, numerous studies support these observations and demonstrate that (1) partial and total rest have remarkably similar affects on arid and semiarid grassland environments (Gomez-Ibanez 1975; Cummins 2009; Weber et al. 2009a; Weber et al. 2009b; Weber and Gokhale 2011) and (2) few tangible differences can be identified among the common rotational grazing schemes in practice today (Jahnke 1982; Sandford 1983; Behnke 1999; Quirk 2002; Coughenour 2008; Homewood 2008; Briske et al. 2008). The cause of rangeland desertification has been attributed to a combination of climatic and anthropic factors (UNCCD 1995; Geist and Lambin 2004; Hill 2006; Lambin et al. 2009) with specific emphasis placed on overgrazing and drought (Bedell 1998; Puigdefabregas 1998). Climate theories have focused upon changes that have occurred over the past 10,000 years and note several periods of increased aridity and still other periods of increasing humidity. In addition, some changes were localized (Stebbing 1935; Niamir-Fuller and Turner 1999) while others were global in nature. Some changes persisted over long time periods while others were much shorter in duration (Brooks 1949; Khazanov 1994). In essence, changes in the earth's climate since the last Ice Age have not been progressive but rather oscillatory. Indeed, it is speculated that the periods of increased aridity have led to the emergence and increased prevalence of nomadic pastoralism and not the inverse, nor a global increase in desertification due to pastoralism (Khazanov 1994). This is because both nomadic and transhumant pastoralism are successful adaptations for survival within highly variable environments (Niamir-Fuller 1999; Khazanov 1994; Salzman 2004; Cummins 2009). While literature from the 1980s and early 1990s repeatedly linked livestock to the degradation of rangelands (Lamprey 1983; Sinclair and Frywell 1985; Wolfson 1990), more recent studies have refuted this by suggesting that prolonged rest leads to even more serious degradation (Seligman and Perevolotsky 1994; Olaizola et al., 1999; Cummins 2009) and questions the continued use of rest-rotation grazing (Briske et al., 2008). Thus, it seems that neither climatic nor anthropic factors are solely to blame for arid and semiarid rangeland degradation but more correctly need to share that blame. It stands to reason then, that some interactive or combinatory explanation should be sought. Hill (2006) arrived at similar conclusions when he examined the arid rangelands of the Transjordan plateau. His conclusion was that climate change was a major factor explaining the disappearance of surface water and changes in vegetation due to increased aridity (Bar-Matthews et al. 1999; Hill 2006). This, however, may also be attributed to reduced soil-water storage capacity, increased surface runoff, and increased soil surface evaporation because too few animals were present on the rangelands for too long a period of time (Savory 1999; Weber and Gokhale 2011). A second major factor cited by Hill was human ignorance regarding the consequences of mismanagement (McGovern et al. 1988). The third causal factor cited was the role of politics (i.e., land management or land tenure Lundsgaard 1974) and the hypothesis that environmental sustainability is inversely related to the levels of hierarchy and dissociation present in the governing body (Hill 2006). What is most interesting among these studies is the clear admission of the substantial role played by humans in shaping the environment (Goldman and Schurman 2000). It seems reasonable then, to consider what humans may be able to do to improve the environment instead of focusing solely upon what we have done to degrade it. Land use, and specifically pastoral land use is highly variable both temporally and spatially (Niamir-Fuller 1999) and while a plethora of terms have been applied to specific styles of grazing (rest-rotation, deferred-rotation, etc. Holechek et al. 2001) these differ only in (1) the proportion of time spent grazing relative to the proportion of time allowed for plant recovery and (2) the realized stocking density at any given moment of time during the grazing period. Time (the period over which plants are exposed to a grazing animal and the rangeland experiences disturbance through herd impact) is not the focal management unit in any of these systems even though numerous studies have stressed its importance for sustainability (Voisin 1988; Snyman 1998; Savory 1999). Voisin, for instance, pointed out promoters of the rotational method "overlooked the necessity for the periods of occupation being sufficiently short". Range scientists have tested many "grazing systems" varying from continuous grazing through an abundance of rotational practices which have been designed without taking into account the full complexity of cultural/social issues, alternative uses, etc. To effectively address complexity requires a planning process that embraces complexity, rather than a pre-determined management system designed for simplicity (Savory 1999). Niamir-Fuller and Turner (1999) note the importance of mobility within highly variable environments (i.e., arid and semiarid areas) and while they opt to focus upon mobility itself, the reason why mobility is so important is intimately tied to Voisin's emphasis upon time. Behnke (1999) echoes these same concerns and the importance of highly mobile herds in his study of the Etanga pastoralists of Namibia. In both cases, mobile pastoralism (e.g., transhumant and nomadic pastoralism) has been considered an ideal adaptation within arid and semiarid rangelands especially in contrast to the alternative, sedentarisation (Salzman 2004). Sedentarisation is the process by which once highly mobile pastoral cultures are concentrated near major trade routes and villages. As a result, the pastoralist no longer needs to rely upon himself and his livestock for subsistence, but upon his ability to purchase goods and services. In a study of nomadic cultures, Khazanov (1994) described a global trend in which nomadism is being replaced by market-oriented ranching (cf., sedentarisation). In these cases, the result is a prolonged occupation of livestock within a given area and the subsequent impoverishment and desertification of the landscape. Keohane (2008) reports a similar transition of Bedouin tribes where livestock were traditionally moved every 3 to 5 days to one of increased sedentarisation around settlements. If sedentarisation leads to the overgrazing of plants, a loss of biodiversity, and ultimately desertification, it seems reasonable to expect the opposite treatment (nomadism) to yield opposing results upon the landscape. It does not however; what has been observed is that both contemporary nomadism and sedentary grazing practices both lead to desertification albeit at different rates (Savory 1999). Hence, mobility alone is not the solution and simply describing nomads as mobile does not adequately capture the essence of their grazing practices. To look at it in another way, would a grazier who moves his livestock to fresh pasture twice each year be considered a nomadic pastoralist? What if he moved his herd 12 times per year, or 150 times per year covering hundreds of kilometers in the process? Only in the latter example would most consider the hypothetical grazier a nomadic pastoralist. In terms of land management, the effective difference between the former examples of punctuated sedentarism and nomadism is the amount of time spent grazing one area before moving to another along with the amount of time allowed for plant recovery (Voisin 1988). While Voisin (1988) advocated that overgrazing of plants was the greatest influence in land degradation, only more recently have the effects of partial rest and total rest been appreciated (Behnke 1999; Niamir-Fuller and Turner 1999; Cummins 2009) as factors that tend to countermand the influence of overgrazing and may be the principle factors degrading rangelands. Similarly, only recently has the role of animal impact on the soil surface--as affected by animal density and herd behavior--become recognized as a significant interrelated factor (Westoby et al. 1989; Savory 1999; Teague et al. 2008). Would a wholesale change in grazing practices that reduces the latency of livestock within a pasture eliminate the negative impacts of partial rest and thereby improve rangeland ecosystems worldwide? To think to suggest so would be naïve. Rather, a comprehensive appreciation for the many causes of land degradation (fire, aquifer degradation, along with overgrazing) needs to take on a holistic approach including a thorough understanding of livestock grazing, fire, hydrology, and climatic variability, as well as the socio-cultural aspects within which this issue is integrally tied (Savory 1999; Munro 2003). By itself, understanding livestock grazing practices and their effects is a hugely significant question and it is certain that some will argue the suggested approach will not yield the expected results in spite of the historical observations referenced throughout this paper suggesting otherwise. This then becomes both a dilemma and a challenge for the future of rangeland ecosystems, range science, range managers, and graziers across the globe. While numerous pastoral cultures have subsisted for thousands of years and continue to survive today, nearly all are facing great difficulties as the world's rangelands deteriorate. Historical observations suggest that degradation is the result of both climatic and anthropic factors. Only recently has specific emphasis been placed upon the effect of sedentarisation and the subsequent feedback cycle initiated through partial rest and total rest prevalent across nearly all continents, societies, and grazing cultures today. It is not argued that livestock grazing can lead to degradation, nor is it debated that specific environmental conditions can result in degradation. These factors, along with others such as fire suppression as well as high frequency burning, aquifer degradation, and land tenure decisions, can and do cause desertification, and often act within a complex system of interaction. What is argued is that these causes do not necessitate degradation. In conclusion, the studies examined in this paper suggest "management systems" be re-considered and supplanted by more inclusive planning processes focused on better managing the spatio-temporal aspects of grazing (animal impact and the duration of grazing periods) as one step toward improving rangeland ecosystems through the use of livestock as a solution to the problem of land degradation (Launchbaugh and Walker 2006; Wallace et al., 2008). Such an inclusive planning process will need to take into account not only livestock grazing, but the entire livelihood of the pastoralist and the environment in which he/she lives. aThis is not to imply that ancient pastoralists developed a utopian society as perfect long-term ecological sustainability of arid and semiarid landscapes have yet to be achieved (Khazanov 1994). This study was made possible by a grant from the National Aeronautics and Space Administration (NASA) Goddard Space Flight Center (NNX06AE47G). Idaho State University would also like to acknowledge the Idaho Delegation for their assistance in obtaining this grant. The co-author Shannon Horst is co-founder of Savory Institute, Albuquerque, New Mexico. This paper was written by the two authors, KTW and SH. KTW conceived of the review paper, performed an exhaustive literature search, and created the initial draft of the manuscript. SH modified the draft paper based upon her experiences both within NGOs and from field experiences abroad. KTW produced another iteration of the paper including his field experience and observation and continued the process until a cohesive manuscript was developed. All authors read and approved the final manuscript.